The current production of animal products, subjects billions upon billions of thinking, feeling animals to live in extreme confinement, where they experience serious trauma, mutilations, and painful slaughter. If there was a way to create meat which looked, tasted and cooked just like the ‘real thing’ and came from a live animal which didn’t need to be exposed to cruel keeping systems or slaughter, would the public be open to it? How should the product be named? There are currently a handful of start-ups which are focusing on just that; creating meat which doesn’t require animals to suffer nor die. Cultured, or lab-grown meat which is more commonly referred to as “Clean meat”, is a groundbreaking technology that is set to revolutionize the global food system. One such start-up, is a Dutch company called Mosa Meat, co-founded by researcher at the University of Maastricht, Dr Mark Post. 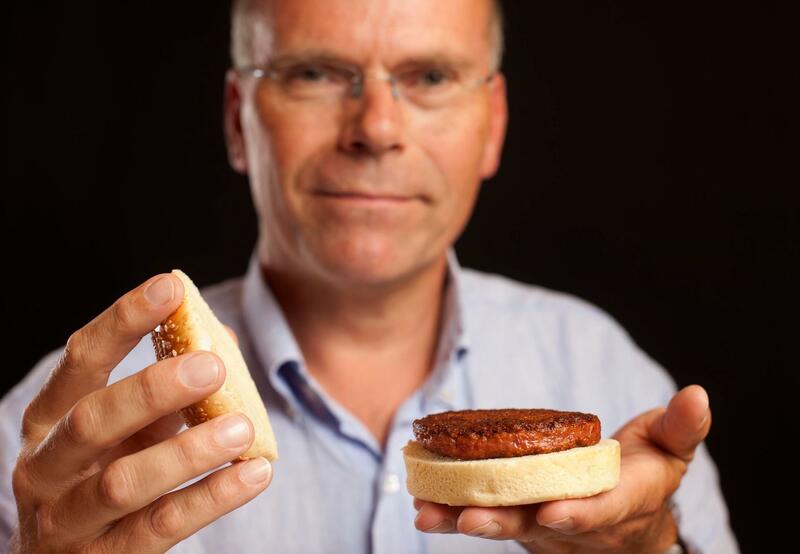 Dr Post, who is known as the ‘father of Clean meat’ was the first who brought clean meat to the public’s attention when it was presented in London in 2013. His 3 main motivations for developing Clean meat are food security, the environment and animal welfare. What exactly is Clean Meat? Rather than obtaining meat from animals raised on environmentally destructive factory farms who are treated as commodities instead of sentient beings which are slaughtered in appalling manners, clean meat is produced by taking a small sample of stem cells-usually from lean muscle- through a harmless procedure in the same way that blood is drawn, and replicating these cells in a culture outside of the animal. After sufficient cells have grown, they are assembled in groups to form small muscle tissue that are very similar to muscle fibers in a steak. The resulting product is 100 percent real meat. It is known that the binding serum used in this technology would be taken from fetal bovines in the past, however Dr Post states that this is not necessary anymore. “There are a number of pressuring reasons to eliminate bovine serum. It is inherently unsustainable, and obtaining serum from unborn calves is incompatible with our animal welfare standards and is also a disease risk.” They are working on optimizing the binding agents with plant based serums instead. Clean meat can be made from any animal that has muscle specific stem cells in muscles which means all the common animals used for food such as mammals, birds and fish. Why is Mosa Meat only focusing on beef though ? “We are focusing on beef because cattle are the least efficient links in food production. Their conversion rate is 15% or lower, meaning that you need to feed cattle 1kg of feed to get 150 grams of muscle out of it. Pigs are twice as efficient and chicken is even 4 times as efficient. Fish is the most efficient. For animal welfare reasons, replacing pigs and chickens with cultured meat variants is a very good idea,” says Dr Post. With the many implications Clean meat could solve, there are still technical, financial and organizational challenges. There are still factors in optimizing the product; where besides the cells, contains no other animal components. Mosa Meat as well as other similar start- ups, still need more financing, which is quite difficult to get from public funding. But Dr Post is hopeful; more and more investors are showing interest. There is also no fear regarding consumer acceptance of cultured meat. “ A number of surveys performed in various European Countries and in the USA, indicate that a large minority ranging from 20-50% are willing to try cultured meat. We are quite confident that when the product is of high quality and not too expensive, the benefits will appeal to the consumer.” With that in mind, Dr Post also states that we can expect the first introduction of clean meat most likely in restaurants and specialty stores in about 3-4 years time and another 2-3 years for super market introduction.